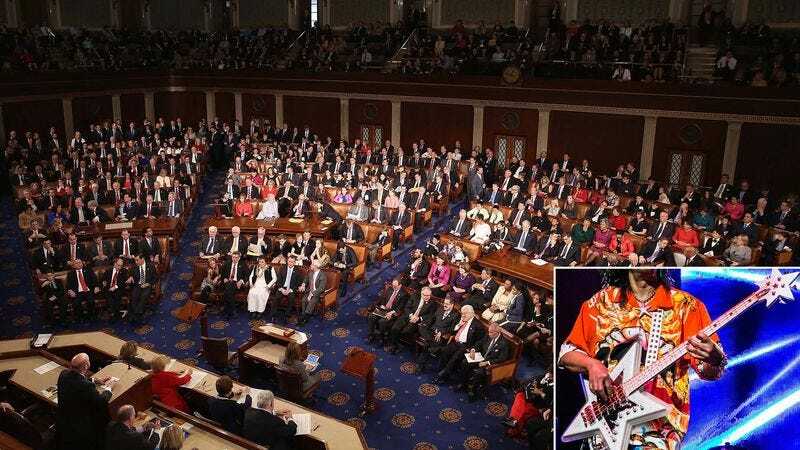 WASHINGTON—Stating that the measure was essential for holding down the beat and getting people outta their seat, Congress reportedly allocated $500 million Monday for the development of funkier bass lines. “This funding will go a long way toward improving today’s bass lines, which have steadily grown less funky and often fail to truly get down, and will help establish a set of new booty-shaking grooves,” said Rep. Dave Trott (R-MI), who co-sponsored the bill with Rep. Cedric Richmond (D-LA), adding that Congress has already begun working with numerous experts, including Bootsy Collins, Victor Wooten, and Flea, to produce syncopated runs and fat, gooey tones on a variety of low-end riffs intended to tear the roof off the sucka. “By innovating new rapid-fire slap and pop techniques, as well as investing heavily in a state-of-the-art envelope filter, we hope to significantly increase the development of thumping old-school bass solos, ensuring that Americans will bust loose on the dance floor for years to come.” The bill comes on the heels of Congress’ recent $1 billion allocation to fund the establishment of a super-tight horn section.